In this day and age drones are available to everyone, whether you’re a professional photographer or just a drone enthusiast, there’s a drone that will suit you. There are drones for people at any skill level, and even kids can get in on the action with these drones. Beginner drones aren’t necessarily the best drones for kids, especially younger children; they are made with adult novices in mind. There are different types of kids drones, with designs that make them easy to fly. Kids have always been interested in flying things, whether it’s paper planes or kites, it’s something kids have been enjoyed since forever, and with the advancement of technology, the next step is flying drones. You don’t want your kid to be discouraged from flying a drone because they find it difficult or frustrating; with this guide, we will help you pick out the perfect drone for your kid. "Ideal For: ​Anyone on a Budget"
The Holy Stone HS170 Predator Mini RC is the perfect choice for kids or anyone else at an entry level. It is super cheap, and since it’s a mini category drone, it’s no bigger than a regular adult-size hand. It’s a great drone for kids, it’s fast, and it’s fun. The recommended age is 14 years which means younger kids should always fly it under adult supervision. It is a highly rated drone, with massive amounts of positive user reviews on Amazon. It always helps to know that other people have had fun with this drone and recommend it for its quality and durability. Let’s have a look at the contents of the box for this drone. The Holy Stone HS170 is a great beginner drone; it is easy to learn and easy to use. It has a headless flight mode, which is especially great for newbies. It comes with 3 Speed modes, the slowest mode is great for beginners, while the fastest flight mode is great once you get used to flying the drone. Drone speed is something you should always keep in mind when flying outdoors. It has 6-Axis Gyro Technology, you can do impressive flips and rolls even with very little flight experience. It’s all just button pushing; the piloting for this drone is not too complex. The controller is a 2.4G remote controller which is included in the box set. It’s a very simple, very comfortable design, the only downside, however, is that all the buttons on it are unmarked. Figuring out the function of each button won’t take long, but either way, there is no reason for the buttons to be unmarked, that’s just a design flaw on the manufacturers' end. The flight distance comes in at around 80 meters from the controller, and the flight time is about eight minutes in good conditions. That doesn’t sound like much, but it’s about what the average flight time is for this type of drone, you can always carry a spare battery with you. Recharge time can take up to one hour; we suggest you swap out the batteries before they completely run out to get optimal control. If you want better flight time, you can always upgrade your battery to a Lithium-Polymer one. The Holy Stone Predator Mini does not have a camera, unfortunately, so if your kid is interested in aerial photography, take a look at some of the other drones in this guide, this drone is primarily a fly-only drone. Even though this is a very small and very light drone, it’s still quite durable. It can withstand q good amount of crash landings and collisions, and in case your propeller gets damaged, it’s good to know that there’s a spare set included. Other than the unmarked buttons on the remote controller there’s not much to complain about. This drone offers great value for its price (especially when on sale), it is a durable, user-friendly drone, and it performs well. The GoolRC T36 Mini is a fun drone that is perfect for any entry-level fliers. It has a bit of a toy-like appearance, which makes it appealing for younger kids. It’s a great indoor drone due to its small size and lightness. It doesn’t require any assembly, and it is ready for flight straight out the box. The manufacturer recommended age is 14. There’s not much in the box, but you have everything you need. The GoolRC T36 is a very small drone which means you should be careful with it when you’re flying it outdoors. You can easily lose it in long grass, trees bushes or similar spaces. The best way to fly would be in clear open space. Before taking it out for a test drive, check out the user manual. It might be necessary to tweak the controls a bit to make sure that the controls are correct. This drone packs quite the power for such a small machine, and it might get taking used to, especially if it’s your first time piloting a drone. The Remote Control, just like the drone, is also very light and toy-like. You’d have no trouble getting used to it if you’ve ever used a standard video game controller. It’s easy to get used to, and it is very comfortable to use. As soon as you get used to piloting the drone, it’s easy to move on to more impressive maneuvers. You can do 360° rolls or flips with the push of a single button. Easy to do, impressive to see. If you lose track of your drone, don’t fret. This drone has a built-in positioning system, with the single push of a button it returns to base, as long as the battery is still working. One downside of this drone is its very short flight time, with just 5 minutes of flight time. The GoolRC T36 is not the best. It does come with an extra battery which can upgrade the flight time to about 10 minutes. The good thing is it takes only about 50 minutes to charge up. Another downside is its very short flight range of around 30 meters. The T36 Mini is the perfect choice for kids who want to get into flying drones. It’s a durable machine which means it can take a quite a bit of damage while remaining perfectly operational. It doesn’t have too many features, but it offers good value for its price. It is a great starter drone for those who want to learn and get good at flying drones. The X5C-1 Explorers offers great value for its price. It’s a bit bigger than the standard kid's drone, but it’s still a light and easy to handle drone. It comes with a removable HD camera, which is great for any kids that want to get into aerial photography. The recommended age for this drone is 14 years old. The drone comes almost ready for flight out the box. All you have to do is add batteries into the remote control, and put on the propeller guards if you want to, and you’re ready for take-off. A very important feature for kids drones, or any beginners, is ease of use and that’s what the Syma X5C-1 is great at. It’s really easy to control, the flight is smooth and you can do some really simple yet impressive tricks with it. 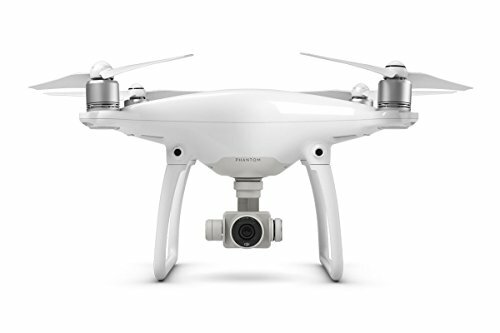 It’s equipped with a 6-axis Gyro stabilization system that helps keep the drone steady and wind resistant. For a drone of this price, there are not many complaints. It has a below average flight time of 7 minutes, but the worst part has to be the battery charge time. It takes 90 minutes or more to charge the battery; it might be a good idea always to carry around a spare fully-charged battery when you’re flying your drone. The transmitter isn’t that aesthetically pleasing, but it works just fine. It has a small LCD display which shows you the status indicators, and the control sticks are comfortable for use as they are spring loaded. The range from the transmitter is 30 meters. The camera isn’t all that good, it’s a small 2MP 720p camera, but it’s still a good enough camera for a beginner drone. If your kid has no interest in photography at all, you can completely remove the camera, which will make the drone lighter, giving you a bit more flight time. If your kid wants a drone with a camera, this is a great beginner drone for kids. It’s easy to fly and control, it’s stable and quite durable and it’s also very affordable. The remote controller for this drone is nothing too fancy; it is, however, big and comfortable enough for kids to use it. The controller gets the job done despite it’s appearance. It has an auto-cutout feature which prevents flyaways. There’s almost no risk of fall damage for this drone as it is very, VERY, light. It weighs around 20g with the battery included. For a drone like this one, a flight time of 6-7 minutes is pretty standard. It’s not too good, but if you invest into some extra batteries, you can extend the flight time duration. The recharge time is decent; the battery charges up in about 45 minutes. The flight distance is on the average side, with about 30meters from the controller. This drone is absolutely amazing for its price, but we wouldn’t recommend it for anyone under the age of 10. 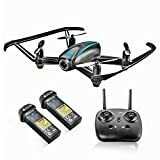 It’s not the best beginner drone it takes more skill to fly and more time to learn than other drones in this category. Drones between $50 and $100 have a few more features than the cheaper ones. Usually the ones that are more expensive come with a camera of some sort on them. If you’re only going to fly your drone indoors, look for nano or mini options. "Ideal For: Everyone, easy to control"
The DJI Tello is a great drone for kids; not only is it a fun gadget to own; it’s also an educational tool. Young drone enthusiasts can fly this drone with their smartphones or a laptop computer. While using a computer to fly the drone might seem difficult, with the help of Tello’s Software Development Kit, flying a drone has never been easier. The DJI Tello is a great entry level drone, but it’s also a good drone for the more experienced pilots. This drone has a bunch of advanced features for older drone enthusiasts. This drone has a long flight duration at around 13 minutes in normal conditions. That’s quite a lot more than a lot of the other drones in is class. Its flight range is around 100 meters which is very good for a drone of its size. It comes with an onboard 5MP Camera that can take 720p 30fps videos. The field of view for the lens is 82.6°, and while the camera might not night be at a professional level, it is exceptionally good for a drone of this category. The video transmission and footage are made smoother and more stable thanks to the two antennas on the drone. These antennas offer electronic image stabilization. You can share any footage you obtain from your through on social media, with a simple press of a button on your smartphone. 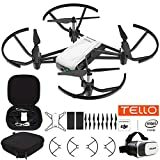 This drone is also compatible with a VR headset which makes for a great First Person viewing experience. The UDI Discovery HD+ drone is a great beginner drone for anyone who wants to learn. Learning this drone will greatly improve your flying skills and will make it easier for you to transition onto more expensive, more advanced drones. The manufacturer recommended age for flying this drone is 14 years old. It is advised that anyone under the age of 14 who wants to fly this drone, does so under adult supervision. The design of this drone is very clean and minimal, which is a good thing. The less clutter there is on the drone, the less a new pilot has to worry about. This drone has big rotors, but they’re widely spaced apart, due to this the drone is far more stable than other drones of this category. It’s a very light drone at just 130 grams. It’s not recommended to fly this drone in rough weather conditions, be cautious when it’s windy outside. It comes in two very simple modes, Low Mode and High Mode. Beginners should stick to Low Mode until they learn and get used to the feel of the drone better before switching to High Mode. Like many drones for kids, you can do both simple and fancy flying tricks with the press of a single button. This drone comes with a 24 GHz controller. It’s a pretty straight forward controller that is comfortable to use, and has buttons which are clearly marked. There are controls for stunts flight modes and the camera. The controller also has an LCD that shows you the speed settings, and you can also toggle the drone’s lights from your controller. The UDI 818A Discovery is equipped with a small and light 720p HD Camera. It can be attached to the drone and it connects via thin power wires. The already included Micro SD Card keeps all the photos and videos on it. The video quality is great for the price of this drone. You won’t find many other HD 30fps drone cameras in this category. The flight time is about average at around 9 minutes, but with the already included extra battery, you can double your flight time to 18 minutes. The battery recharge time on the other hand is pretty slow. It can take up to 2 hours to fully recharge your batteries, which is a LOT compared to other drones of this category. We recommend you get an extra battery or two for this drone. The range, like with most other drones in this category, is 30 meters. A lot of the drones do most of the work on their own, this one, however, leaves it all up to the pilot. For any kid who wants to learn how to pilot a proper drone, the UDI U818A is a great learning tool. It’s not the greatest in windy conditions, but when flown in clear weathers, it’s the perfect drone. It is also quite durable and it comes with a spare set of propellers. This category of drones is mostly for kids older than 14. If you want something more powerful and durable, these are the drones you should look at. "Ideal For: Kids and Teens with some drone experience"
The Altair Aerial AA108 is quite the capable drone, it has three flying modes and you can take-off and land the drone with the press of a single button. Unfortunately has no camera stabilization and a short flight time. The Altair AA108 is a great camera drone, made for young pilots. It has an immersive first person view, which makes for a great flying experience. The great thing about this drone is that beginners can learn how to fly it at their own pace. It has Low, Mid and High flight modes. The features the Altair AA108 offers are what you’d expect to find on some of the more expensive drones. It is a drone packed with tons of great features, which makes for an excellent choice for a training drone. It has a decent flight range of about 100 meters and has out of range and low battery alarms so you don’t lose your drone. The Altair AA108 comes with a 720P HD 120 degree wide-angle camera. You can see what the camera sees from your smarpthone and the first person view makes for a great flying expereience. You don’t need a smartphone to fly this drone, but it’s necessary if you want to experience the First Person View. You also need a smartphone if you want to draw your own custom flight path for your drone to follow. It is, however, recommended that beginner pilots fly using the remote controller until they get used to piloting. First Person View is something that should be left for a slightly more experienced user. There are not too many downsides when it comes to the Altair AA108, the only real issue with it is it’s short 8 minute flight time. Fortunately, it does come with an extra battery and the charging time around 45 minutes, which is decent. Another problem with this drone is flying it in windy conditions. You should avoid flying it in winds over 10mph as this drone is very light and it can be very easy to lose control of it. The last issue with this drone is that it has no camera stabilization, the quality of photos and videos is still decent, but it’s not the best. "Ideal For: Beginners, crash friendly"
The Parrot AR 2.0 Elite Edition is a very capable drone. It’s popular with already experienced pilots who want to take it to the next level. The recommended age for this drone is 14 years old, it comes with no remote control, and you can only pilot it with your smartphone. That’s why we recommend this drone to the older kids who are more familiar with smartphones. This drone is available in three styles: sand, snow, and jungle. To fly the AR 2.0 Elite, you need to download the FreeFlight piloting app to your phone or tabled and set it up. Setting the app up shouldn’t take much time, but you should still follow the instructions carefully. If you rush through the setup, you might mess some of your configurations up, which will ultimately lead to unenjoyable flight experience. When you’re done setting up, connect your device to the drone’s Wi-Fi signal. The app is very simple, making for an easy flight, but if it is your first flight, use the slowest speed modes. Flying is very easy once you get used to it, but it may take a some time to work out all the functions and features of the phone app. The camera on this drone isn’t the greatest, but it’s still pretty decent. Most users are satisfied with the photo and video quality of this drone’s camera. You can directly stream your drone’s live food to your smartphone, or you can save videos and photos to a USB stick. Fiddle around with the camera and explore all of its options and settings to get the best results. The manufacturer claim for this drone’s flight time is 12 minutes, but in reality, it’s closer to 10. It is always good to have an extra battery around, regardless of what the flight time is. The recharge time is pretty long at around 90 minutes, and the flight range is about 50 meters. As far as drones for kids go, the Parrot AR 2.0 Elite isn’t the best as a first drone, but it is an incredible drone for already experienced pilots. It’s a really difficult drone to master, but if you have any prior flight experience, it shouldn’t be too hard to get used to. It does have some downsides as all drones do, but it’s an overall great drone. It’s a very sturdy and stable drone that keeps itself steady in the air; it can perform impressive tricks with the press of a single button and the Flight app needed to pilot this thing is really convenient. These drones come at different prices. Programmable and offers good flight time. It has a decent camera and has extra batteries included. When Ruaan is not reviewing drones, he is busy flying his Mavic 2 Pro all over Oslo in Norway. BuyBestQuadcopter.com participates in the Amazon Services LLC Associates Program, an affiliate advertising program designed to provide a means for sites to earn advertising fees by advertising and linking to Amazon.com.